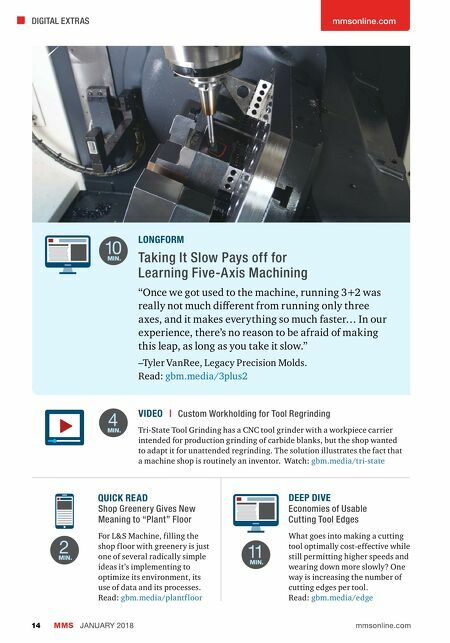 mmsonline.com DIGITAL EXTRAS MMS JANUARY 2018 14 mmsonline.com LONGFORM Taking It Slow Pays off for Learning Five-A xis Machining "Once we got used to the machine, running 3+2 was really not much different from running only three axes, and it makes everything so much faster… In our experience, there's no reason to be afraid of making this leap, as long as you take it slow." –Tyler VanRee, Legacy Precision Molds. Read: gbm.media/3plus2 QUICK READ Shop Greenery Gives New Meaning to "Plant" Floor For L&S Machine, filling the shop f loor with greenery is just one of several radically simple ideas it's implementing to optimize its environment, its use of data and its processes. 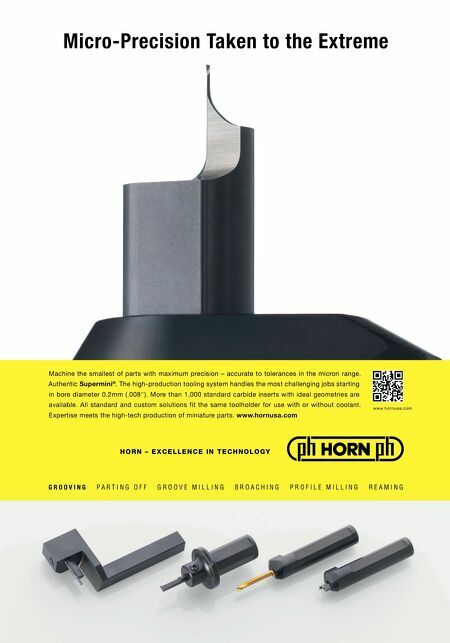 Read: gbm.media/plantf loor DEEP DIVE Economies of Usable Cutting Tool Edges What goes into making a cutting tool optimally cost-effective while still permitting higher speeds and wearing down more slowly? One way is increasing the number of cutting edges per tool. Read: gbm.media/edge VIDEO | Custom Workholding for Tool Regrinding Tri-State Tool Grinding has a CNC tool grinder with a workpiece carrier intended for production grinding of carbide blanks, but the shop wanted to adapt it for unattended regrinding. The solution illustrates the fact that a machine shop is routinely an inventor. Watch: gbm.media/tri-state 11 MIN. 4 MIN. 10 MIN. 2 MIN.